I'm delighted to welcome one of our favorite Brits back to the blog today. They say that the third time is the charm and Anna Sugden's third career - that of published romance author - has certainly charmed this reader. 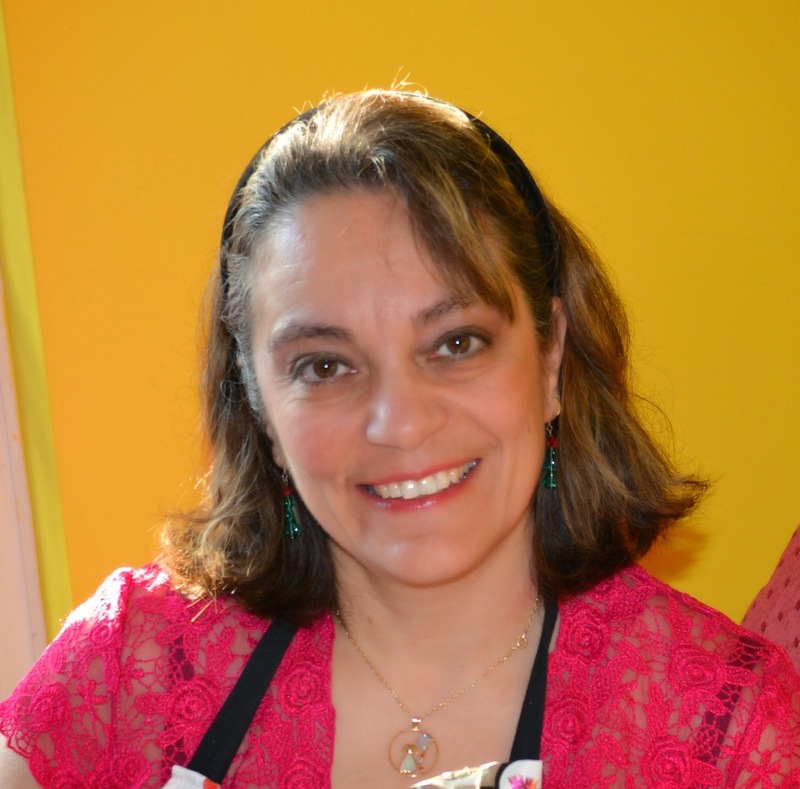 Following careers in global marketing and teaching, Anna finally turned her focus to writing when her husband was transferred to New Jersey in 2002 and post 9/11 restrictions prevented her from obtaining a work permit. 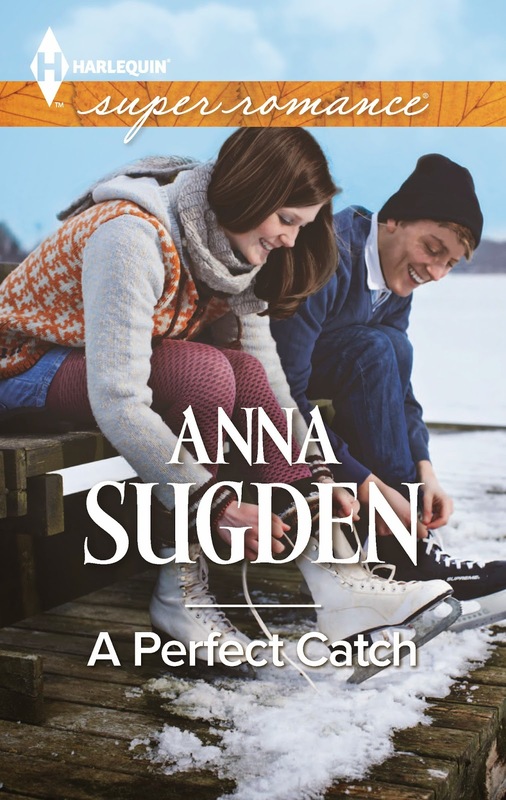 After three finals in the RWA Golden Heart® awards, Sugden sold her first book to Harlequin in 2012 and the New Jersey Ice Cats hockey heroes were born. The third book in the Ice Cats series, A Perfect Catch releases this week and continues to heat things up both on the ice and off! Thanks for joining us today, Anna! February is one of my least favourite months of the year. The days are still short, the nights are still long. It’s dark when you get up and dark before you even have dinner. And it’s usually the coldest, wettest, greyest month of the year. One thing I do like about February is that it gives me the chance to enjoy some warming foods. Stews and soups and bakes, chili and Spaghetti Bolognese and risotto -- yum! There’s nothing quite like a steaming hot bowl of your favourite winter’s dish to cheer you up, even on the coldest, wettest, darkest night! And there are plenty of reasons not to include a single lettuce leaf <g>. Those of you who know me, know I’m not a huge fan of sweet treats. I’m much more likely to sneak crisps (potato chips) than I am cookies and popcorn (hot, buttered) than chocolate. One of my favourite indulgences is home-made cheese scones. More on them shortly! This year, February is a fun month for me as I have another book launch! The third book in my New Jersey Ice Cats series -- A Perfect Catch -- is released this month. For those of you who have been following the series (a heartfelt thank you! ), this is Ike and Tracy’s story. A chance to find out what went wrong between these former lovers and whether they have a chance for a future together. He's the perfect catch…for now! When it comes to romance, Tracy Hayden is not looking for a rematch. She's had epic passion—and problems!—with professional hockey player Ike Jelinek. Brilliant on skates and magic in bed, his too-traditional-for-her views were like a bucket of ice water on their affair. Then an injury takes Ike out of the game, and everything changes. Suddenly he needs her services-providing business—even though he once claimed it was their biggest problem. Tracy's determined to be professional, despite the sizzling attraction between them that won't go away. Maybe they need a second fling to fix that! Tracy had just reached Ike’s room when she heard him roar. “You’d be miserable, too, if you weren’t even al­lowed to use a freaking knife and fork,” he growled, crossing his arms awkwardly over his broad chest. The bandages that covered his arm from fingers to shoulder hampered his movement. The flowery pastel-blue gown should have looked silly on such an obviously masculine body. Instead, it emphasized his honed chest and arms, making him look more manly, rather than less. But Ike didn’t need to know that. Ike’s green eyes turned fiery, challenging her to take him on. She tamped down her body’s instant heated re­sponse. Besides, she shouldn’t tease a wounded man. Especially one whose pride probably hurt as much as his arm. So what does this have to do with one of my favourite comfort foods -- cheese scones? Well, in the book, Tracy makes cheese scones. As a special treat to say thank you to all of you at The Romance Dish, and to make sure February gets off to a great start, I thought I’d share the recipe with you. Roll out so that it’s approx 1/2in thick. Use a 5cm/2in cutter to cut out rounds. Try not to twist as you’re cutting. Knead remaining dough together, roll out and repeat for more rounds. Place rounds of a greased tray and brush the tops with milk. Bake for 12-15 mins until golden. Over to you. What is your favourite comfort food to eat during February? One lucky commenter will win a copy of A Perfect Catch. Congrats on the new release, Anna. A nice bowl of chili is perfect for the cold weather in February. Great post.Sounds like an exciting read. I'm looking forward to putting this series on my TRL. Especially with me being here in Jersey. Thanks for the delicious recipe. Hope you give the books a try, Carol. I've loved all three and can't wait for more! Hey Carol! Special welcome for another Jersey Girl (even if I'm an adopted Jersey Girl *g*)! Hope you enjoy the series! February is usually very hot here, so ice-cold watermelon for me. Fresh fruit is my hot weather go-to too, Mary! Hi Mary! Great to see you here! I could do with a little heat - it's frr-rrr-eezing here today! Even so, the watermelon sounds yummy! Don't they sound yummy, Anita? I'm definitely making them! Spaghetti and meatballs. Another favorite! I love spaghetti and meatballs too! Soups are my favorite winter food--potato soup (loaded, of course), New England clam chowder (for this Southern girl), tomato soup (canned by my Aunt Clara and served with grilled cheese sandwiches), and my favorite--everything-but-the-kitchen-sink vegetable soup (with cornbread). Shh! Don't tell anyone, but in the privacy of my home I surrender to uncouthness and crumble the cornbread in my soup bowl and ladle the soup over it. Yum! I think I just planned dinner tonight. Hey Janga! Great to see you here! Aww thank you for being quick off the mark and buying A Perfect Catch! I LOVE soups and your faves sound delish! Is it uncouth to crumble cornbread and ladle soup over it? In that case, we're uncouth together! Doc Cambridge makes great cornbread! Mmmmm. Sounds yummy, Janga. At lunch with a girlfriend a couple weeks ago I ordered the grilled cheese and tomato soup special and found myself wondering why I don't make it more often at home. It was a much beloved staple of my childhood. Hi Anna! Thanks so much for visiting with us today. Sounds like you're enduring weather very similar to mine today. I'm looking out my window at bare trees, low hanging dark gray clouds and cold, blustery winds. Definitely a day to play inside or maybe get lost in a good book. Hey PJ! Big hug! It's always my pleasure to be with you all here. It's actually been a gorgeous, sunny day here, but OMG sooooo cold! Reminds me of being in NJ! :) Even saw our first snowdrops today, so was happy! Stay warm! Love a roasted chicken dinner! with mashed potatoes and fresh veggies - maybe green beans - like in that yummy meushroom soup casserole - remind me of family dinners when I was a kid! Thanks for stopping by Di! Oooh LOVE roast chicken dinner! Doc Cambridge and I are always saying we should make one more often. Except he doesn't like mashed potatoes, so we do roasties. One of my favorite comfort foods for February is soup, especially pea soup made with the leftover ham bone from Christmas. The ham bone is in the freezer and the dried peas are in the pantry waiting for the perfect day. Hi Laura! Do let me know how they turn out! I love crab soup - there's a place in Charleston, SC, that does the most amazing she-crab soup - we have it every time we visit! Chili made with ground turkey or chicken vegetable soup. These are my favorites on a cold winter's day. Joan, you're not the first to mention chili with ground turkey. I've always made mine with beef but I do like ground turkey. I can see I'll be giving that a try. Thanks for stopping by Joan! LOVE chicken soups, especially with veggies we've grown! Congrats on your third Ice Cats book, Anna! That photo of you is so lovely. You're one of those women who, luckily, ages like fine wine. Not that you're old -- about 35, right? There are two good things about February in my mind: (1) I have a birthday, some years and (2) when we were young and broke we were so happy our paycheck only had to stretch 28 days! Chili is my go-to winter dish, along with other soups and stews that I sort of make up as I go along. They're always a bit different, but Dr. Big really loves them and I can usually freeze half for later since there are only two of us now. Cheese scones! I'm going to try that right away. Sounds delish! I make a lot of soups this time of the year too. There's just something so comforting about a pot of hearty, homemade soup. Tonight, though I'm making a chicken pot pie. Another winter favorite! Thanks so much! As one of my beloved Romance Bandits sisters, you've inspired me and kept me going to get here! I love stews like that - tossing in whatever we have as leftovers or have picked from our vegetable allotment - and we do the same, freezing for an easy dinner! I love a nice bowl of tomato soup with a grilled cheese sandwich, And today with more than a Ft of snow, it's just the thing. Thanks for stopping by, Kathleen! There is something very comforting about tomato soup and grilled cheese sandwiches! We had 1cm of snow and I'm thinking of just that for lunch! PJ - we used to have American cheese in ours, but we've switched to cheddar. The real treat is when you have a small pot of leftover cheese sauce, from dinner (like for cauliflower cheese or lasagne) and then use that! YUM! Hi, Anna! Congrats on your new release! My favorite February (winter) food is either home made soup or chili. Do you have a favorite soup, Cathy? Hey Cathy! Great to see you here! I wish I thought to make more homemade soup - I always forget it's an option! Nice comfort food would be homemade soup or maybe a grilled cheese sandwich. Kim, what kind of cheese do you use in your grilled sandwich? Thanks for stopping by, Kim! Another vote for soup and a grilled cheese sandwich! Favourite soup? Hi, Anna!!! How fun to have you here at TRD!! I don't think I have a February comfort food. Today is a snow day, so I did pull peaches from the freezer (from my mother's little tree) and made a peach cobbler. Wish I could say it was good, but it is a tad bland. Pouring milk over it helped a little. I very much like scones and will give your recipe a try. Hi Deb! I think a lot of people are having snow days today. I'm feeling sentimental today too. Hey Deb! Great to see you here! Ooh peach cobbler? That would go down rather nicely. Though I'd probably add double cream - well, we are talking comfort food! Do let me know how you get on with the cheese scones! Hiya Romance Dishies! Hiya Anna! Anna, those cheese scones sound almost as luscious as A PERFECT CATCH! I don't like February either - and for the opposite reason you don't like Feb. Here in Australia it's a horrible hot, humid month - and we've already had a January sent straight up from the infernal regions. I've got an emigration application in for Alaska! It's Anna, our happy wanderer! I've been enjoying your photos on facebook. You've had a busy summer! I've been all over the place, PJ! Not Alaska yet, though! :-) I've got (hopefully!) some really nice ones of the Blue Mountains trip this week. Hope you like those! OMGosh your scone recipe sounds fabulous! I love scones, but I've never tried to make them. I had the impression they were a little tricky, but this doesn't look too bad. Love the excerpt. It makes me want to stop working and go start reading right NOW. (bad Cassondra. Bad.) *grin* Huge congratulations on the new book, and on this series overall. I've loved it since I first heard about it the year we were finalists together. PJ, thanks for hosting! Always a good time at the Dish. I love them too, Cassondra. I'm definitely trying Anna's recipe. Hey Cassondra! Thanks for coming over - you've done such an awesome job on the Romance Bandits blog! The great thing about cheese scones is that they don't have to be as perfect as fruit or sweet scones. I'm sure you'll have no problem with them! BTW, I LOVE the Ice Cats series and am excited for Ike and Tracy's story! WOOT! Thanks for hosting Anna, PJ and Andrea!! As Cassondra says, always a great time on The Dish! I love pot pies, Jeanne. In fact, today's post inspired me to make a chicken pot pie. I just pulled it from the oven and it smells heavenly! Did you have to mention pot pie and shepherd's pie? I actually cooked this weekend and now I want to cook again. Ack! Anna, woo-hoo! Congrats on your new release. I love this series and am eager to read this latest installment. The scone recipe sounds yummy. I may have to venture past my general kitchen ineptitude and try it! My favorite comfort food to eat in the winter is mac and cheese. I love a good mac and cheese. The ultimate comfort food. Aww Thanks so much, Nancy! I'm eagerly awaiting your next Mages book! I LOVE mac and cheese - had it last night, in fact. My latest thing is to have it with leftover spaghetti sauce ... yummy! LOL PJ More like a mischief of Banditas! Or is that a rooster of Banditas? I'm so lucky to be part of such an awesome group of women and writers! I'm eagerly awaiting Cassondra's book(s) too! Aww thank you catslady and thanks for dropping by today! LOL chocolate is the ultimate comfort food, isn't it?! Oh, chocolate chip cookies, warm from the oven! Great post--congrats to Anna on the new release! Hi HoldenJ and welcome! Thanks for stopping by and for the congrats! You're wicked - just what I need right now ... chocolate chip cookies, warm from the oven! Hey Caren! Thank you so much! Oooh buttermilk cornbread sounds delicious - do you have a recipe? Actually, since we started growing our own corn, Doc Cambridge has started making cornbread! One of the benefits of being married to a chemist is that he's not afraid to play with recipes until he gets it right! Hi Debbie! Great to see you here! Two more votes for chili and vegetable soup! Hi Peggy! Thanks for stopping by! Sounds like the winner is chili! Thank you everyone who stopped by and to the wonderful, amazing, fabulous PJ for letting me hang with you all today. Sorry I wasn't here later on, but we had an unexpected guest for dinner (a nice one!). Stay warm or cool, depending on your hemisphere! And please do let me know how you get on with the cheese scones recipe! I tried to keep the measures as international as possible! Hi Anna! Is it bad that my comfort food is chocolate? I love a nice mug of hot chocolate with whipped topping and I love eating them too! And February is the perfect time to buy chocolates because of Valentine's Day and all the choices out there! :D If we're talking about cooking comfort food then I'm totally lost since I'm such not a cook, I just mooch off my sister! I grew up on the Canadian border in NE NY. Hockey is a way of life up there, although most follow the Canadian team which are more like the local team. We live in the South now and don't see much hockey. I watched a game on TV the other day and had forgotten how fast the game moves. It can wear you out just watching. Comfort food in the winter for us has always been a nice pot of chili, beef barley soup, my aunt's goulash, or a nice pot roast. These are favorites and taste so much better when it is cold and miserable outside. Thank you for the recipe for the scones. I look forward to trying it. They should go well with the beef barley soup. Forgot to mention I read A PERFECT DISTRACTION. Enjoyed it and look forward to catching up on the series.